And, like all good moments of music that you experience in your life, a lot of these will have stayed with you as fond memories; for me, I’ve always had a soft spot for the songs in A Life Less Ordinary and Empire Records. Need to ensure no one gets in the lift with you? Just sing Journey with gusto. An unexpected and genuinely hilarious scene, one which works due to Evans’ ballsy delivery. A great scene in this underrated Danny Boyle film. It got me hooked on Bobby Darin for a fair while and remains one of my favourite Cameron Diaz performances. It’s hard to pick one scene in a film packed with musical gems. This one is so much fun that it makes the cut. And Zellweger is so sweet singing her little heart out. Apparently on a long drive the two actors were mucking about singing in character with director David Ayer in the back seat. He caught this and stuck it in the movie. That’s a moment. This Sofia Coppola film which gave Scarlett her break remains my favourite of her performances. As she donned a pink wig, Bill Murray’s resistance was futile. Comedy that stands the test of time, now that’s tough. This film holds up though. A modern classic, encapsulated in this memorable scene. The hurtin’s on me yeah! I have to say, I know one or two girls that would fall over themselves to get a piece of Gordon-Levitt. Here he gives us a masterclass in how to effortlessly rock a tank top. Remember the first time you saw this film? Every scene held a wonderful surprise. This one was a classic example as I doubt anyone saw this 1976 song by the Starland Vocal Band coming. I am sure I’m not the only one that’s had mates reenact this in the direction of unsuspecting women; essentially cornering them till the song is done. Ladies do love a crooner. 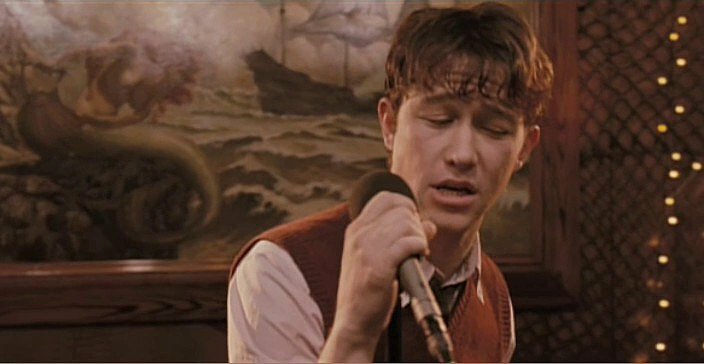 Filmed with Mulligan singing live in one unbroken shot, this scene is so raw and affecting that I’ve only been able to watch it twice. Along with Fassbender, Mulligan elevated this film to pure art. Supremely creepy, yet mesmerising in a way. An innocuous little scene in the middle of this – clearly quite bonkers – Michael Bay movie has Buscemi singing like a loon as their plane prepares to crash. This 1986 John Landis classic was packed with wonderfully witty musical ditties. Whilst ‘My Little Buttercup’ tends to get all the plaudits, honorable mention should go to this song too. Monuments Men: an admirable flop?